Chaz Davies will learn in the next few days whether he has landed a coveted Ducati ride in the 2008 MotoGP world championship. The British rider has been told by factory team boss Livio Suppo he should have an answer imminently on whether Chaz Davies will land a dream MotoGP ride, with Davies being linked to a slot in the satellite D’Antin squad next season. Chaz Davies completed an impressive two-day test session at the Mugello circuit this week in what has only strengthened his claim for a surprise call-up to the Spanish-based D’Antin squad. Failure to beat off fierce competition from the likes of Alex Barros, Shinya Nakano, Toni Elias, Alex de Angelis and Sylvain Guintoli for a D’Antin ride could see Chaz Davies offered the chance to become full-time test rider for Ducati instead. Davies, who escaped unhurt from a small crash on the second afternoon yesterday (Wednesday), told MCN: “I’m in contact with Livio quite a lot and I spoke to him again tonight (Wednesday) and he said he’ll come back to me in a few days with what he thinks. Chaz Davies said he would prefer to continue racing full-time, but admitted a test ride with the Bologna factory would be something he would have to give serious consideration. He is just happy though to be in the frame and attracting the interest of Ducati, just over 12 months since his world championship career fell apart because of financial problems which hit his Aprilia 250 squad. He landed the test ride this week after impressing during a replacement ride at the American MotoGP in Laguna Seca at the end of July. He was drafted in at the 11th hour to replace injured German Alex Hofmann and finished in a creditable 16th place having been forced to pit with a broken rear sprocket. “It’s funny how it turns around. I think this is the chance that I need and it would be nice to land a ride for a season in MotoGP, especially on a Ducati with how things are going for them at the moment. You can just see how well they work from just being at the test and how they’ve got six guys at a computer working non-stop. It would be great to have a go racing for them. “Livio says there might be a possibility of me being the test rider but he said he would have to talk to me a bit more about that later because he would need to speak to Bridgestone and other people. I’ve got to consider whether I want to be test rider. “I’d much prefer to be racing but then again it is a factory Ducati and not many people get the chance to ride a factory Ducati. And it could open doors in the long run so I’d have to consider it,” added Davies, who said he was currently stalling on entering serious negotiations with a number of interested parties in the American series chasing his services next season. Chax Davies currently races for the Celtic Yamaha squad in the AMA Supersport and Formula Extreme championships and he said: “I’ve got a few things going about in America and I’m kind of putting those on hold at the moment. Good friend and MotoGP world championship leader Casey Stoner drove to Mugello to watch from trackside and offer advice and Chaz Davies said it was invaluable to have the Aussie on hand. “That was really good having him helping me out. He was out on the track and he was cleaning my helmet for me so it was good. He wanted to help out as much as he could and give me some feedback on what he has picked up. “He was telling me about the style of picking the bike up and accelerating and how to get it turned for the last part of the corner. Just basically he was telling me what he finds works in every area of the bike. “It was just interesting having his view on it because obviously he’s got things completely dialled at the moment,” said Davies, who worked with Alex Barros’s D’Antin crew chief and one of Loris Capirossi’s full-time mechanics at the test session. And he said the fast, sweeping and technical Mugello circuit was in stark contrast to ride than the much tighter Laguna Seca circuit where he made his surprise debut. He said: “Ducati wanted to see me on the bike because they wanted to see what I would be like on a completely different track. You couldn’t get two other ends of the scope to Laguna and Mugello. “So they were just curious to see how I go and I think they were curious to see what my feedback was like. It was nice to get more time on the bike and really try and learn what the bike is like, and to get it set up properly for myself in a more relaxed environment. The small crash might have been the only low point for Chaz Davies as he broke the 200mph barrier for the first time in career on the long Mugello start/finish straight. “We’d made a couple of changes to the bike and I went back in the afternoon and I had small tip off on the out lap. I just got caught on a bump and it was a really weird crash. Otherwise it was really positive and they seemed happy with what I did. “I got a much better sensation for speed at Mugello because Laguna actually dulls the power; well that’s what Casey said. I was saying it felt faster and he said that Laguna seems to dull the power. Down the start/finish straight at Mugello you are doing 205mph and by the time you hit the brakes I was doing 30mph quicker than I’ve ever been before. “Those first few laps were quite interesting and that little rise on the straight it picks the front wheel up. 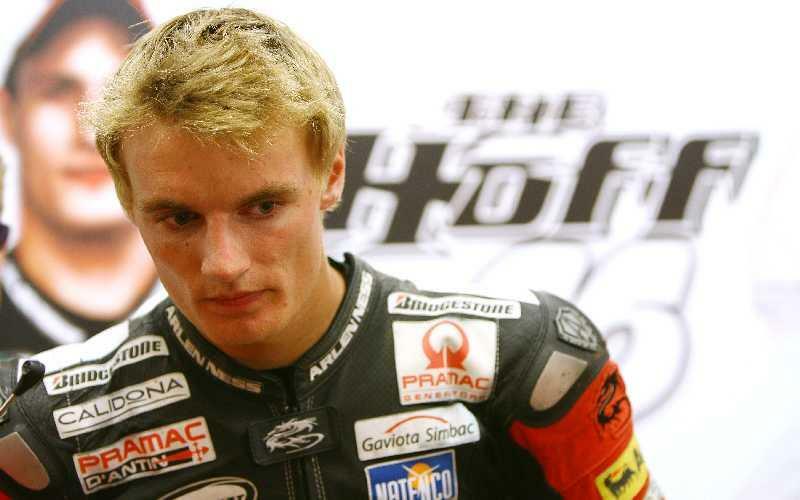 You are flat in top gear and the front wants to pick up, so it’s pretty wild,” said Davies. Chaz Davies flew back to London from Italy late on Wednesday night and then flies straight to California tomorrow morning (Thursday) where he will ride in the Laguna Seca AMA round this Sunday.